Social Media Pages - Social Media Consulting - Learn how social media websites are helping webmasters and online marketers promote their websites. Learn how social media websites are helping webmasters and online marketers promote their websites. Links to selected social media pages are included on the website. In simple terms, any website that allows the user to interact with the site and other users can be defined as social media. 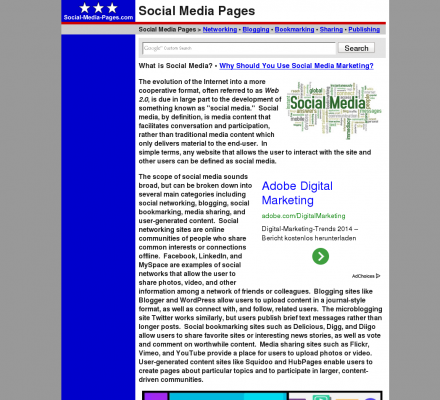 Description: Social media web pages and websites are the focus of this social media marketing guide. In simple terms, any website that allows the user to interact with the site and other users can be defined as social media.